This briefcase display has everything necessary for a professional presentation. The unit conveniently folds into portable trunk for easy transportation or storage. The 24"wx 18"h briefcase display opens into a 44"wide fabric covered display. Standing about 23" tall with the included custom header. This briefcase display is perfect for salespeople, teachers, speakers or anyone who needs a portable lightweight exhibit. Hook and loop attachments easily stick to each of the three fabric covered panels. This briefcase display comes with a center panel measuring 22.5"w x 16.5"h and two side panels measure 10.5"w x 16.5"h. Information and graphics can easily be added or changed by using hook and loop strips or dots. This briefcase display is only 6 pounds. Success has never been so portable. The custom header on this briefcase display is available with a 1 or 2 color text/logo on a white background. The header is approximately 22.5"w x 7"h. Please review the briefcase display text/artwork guidelines before ordering for guidelines and vinyl colors. 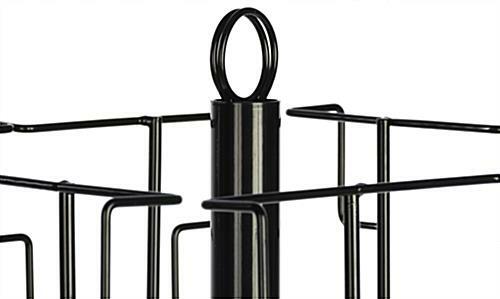 Sign frames and brochure holders can also be attached to your briefcase display. Take a look at the hook and loop VELCRO® brand attaching accessories before you order for more ideas and extra hook and loop to help customize the exhibit. 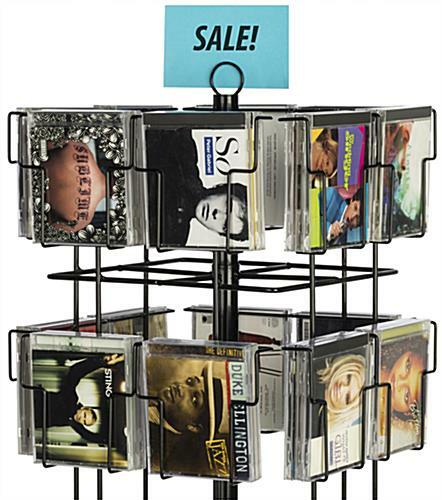 These spinner display racks with 6 tiers are designed for ultra organization. 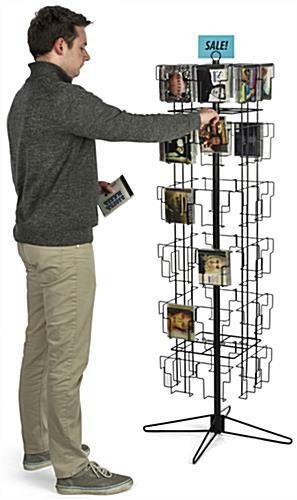 Each steel wire stand has 48 pockets for CD's and DVD's. The black racks provide room to sort and store a variety of merchandise. The simple design gives customers access to your producs without hassle. These racks are floorstanding at 63" tall to save counter and shelf space. 15.0" x 63.5" x 15.0"